An interesting tale connected to last fall’s collapse of the Equity Poker Network and its flagship site, Full Flush Poker, continues to emerge. Recently, a small collective of unidentified affiliate operators obtained the former FullFlushPoker.com domain via auction, for an undisclosed but likely nominal price, and have put up some limited information about the US-facing grey market site’s collapse. The purpose behind the new message greeting visitors to the website (reproduced in its entirety at bottom) remains opaque. The message claims to be on behalf of the group of “concerned affiliates and online poker sites” — the latter likely a reference to affiliate sites, and not to rival, operational sites — who continue to pursue some form of restitution in the wake of Full Flush’s collapse. While the scope of Full Flush’s failure pales beside that of such earlier collapses as Lock Poker, UltimateBet, Absolute Poker, the original Full Tilt Poker and others, there are still a sizable number of affected players involved. Various reports indicate that Full Flush and the Equity Poker Network folded up their virtual tents last October while still owing more than $2 million in player balances. None of that money has ever been returned to Full Flush customers, nor is it particularly likely that assets open for seizure can be easily identified. 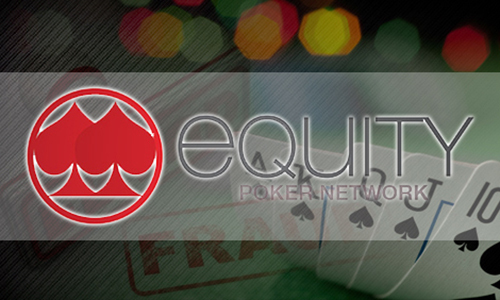 The “owners” of the original Equity Poker Network (EPN) and Full Flush have never been fully disclosed. However, that word is hyperlinked within the current FullFlushPoker.com text to a whistleblower post on a popular poker forum. That post, which names several individuals connected to EPN or Full Flush but whose veracity cannot be fully verified, publicly duns the following: Jorge Barahona, Hugues Marion, Victor Bigio, Clive Archer, Ben Johansen, and Leon Vargas. Archer, who claimed to be one of the founders of the EPN when it was created back in 2014, backpedaled from his frontman roles at EPN and Full Flush at just about the time the operation first exhibited signs of financial stress, in 2015. The EPN launched with grandiose promises including a “shark tax” designed to penalize network sites who relied on veteran, high-volume grinders, and reward those who recruited net-depositing players. The EPN never really promised much to players, however, in the way of bankroll safety and security, and the network’s failure likely represents another example of shady operators spending player deposits freely to continue operation and pay their own salaries. The notice from the new owners of the FullFlushPoker.com website also contains a warning of sorts. The warning is to cheated Full Flush customers who might pursue a supposed legal action being brought against various former EPN and FF officials by a website entity, GameProtect, though there’s no hard evidence any such action has commenced. The eastern European affiliate operator behind Game Protect has sought contributions from cheated Full Flush players for many months, including a long series of posts at the PokerFraudAlert forums. Full Flush Poker and the Equity Poker Network closed operations as of October 2016. Players with unrecoverable funds should continue reading below. We are the new owners of the domain FullFlushPoker.com – purchased via auction. We are NOT associated with the prior owners. We do NOT have your money. We are NOT liable for the debts of the prior owners of this website. Please continue reading. The Equity Poker Network has gone out of business. Full Flush Poker, the flagship skin owned and operated by the Equity Poker Network, has also gone out of business. The owners have ceased returning calls, instant messages and emails. Sources tell us that they have relocated from the countries in which they were operating, and a number of parties were financially injured as a result of this company closure. Player balances were left outstanding, software vendors were left unpaid, marketing affiliates were stiffed, and employees in the Costa Rican offices did not receive weeks worth of pay. There is a supposedly pending lawsuit, though no evidence of this litigation has been publicly released, it very well may be a scam. Even if it is legitimate, we do not feel that the attorney, even if the litigation succeeds, will be able to recover any funds. Here is a good explanation as to why it would be likely to fail. Furthermore, the lawsuit and the people promoting it are unknown and unproven. Thus, we do not recommend players to provide personal information to these parties or to send any money upfront as they have requested. To be clear, we are not associated with, nor do we endorse, these parties. A group of concerned affiliates and poker sites have come together in an attempt to help victims of the Equity Poker Network and Full Flush Poker business failure. Our goal is to provide a means by which players might recover their lost balances. While we finish working out the details of this program, we are asking players who suffered financial harm to contact us and provide information regarding the extent of their losses. Players need not provide any personally identifying information when submitting a claim.